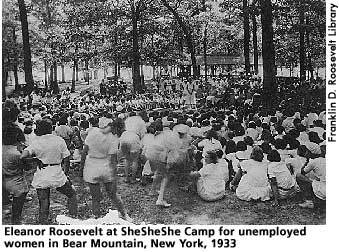 On March 21, 1933 President Roosevelt sent Congress a request for legislation aimed at unemployment relief, in which he proposed the Civilian Conservation Corps (CCC), and ten days later FDR signed the CCC into law. The CCC was one of the most popular New Deal programs and employed a quarter of a million young men each year in forestry, flood control, and beautification projects throughout America until the program expired in 1942. ER was excited by the concept of employing urban youth between the ages of eighteen to twenty-five in outdoor activites that included education and a respect for the environment. Troubled by CCC's male-only focus, ER campaigned for a parallel organization to the CCC for young women, which would be comprised of residential worker schools and camps for jobless women. Despite her best efforts, the idea of "She-She-She Camps" was largely scorned by the Roosevelt administration and most New Dealers. Frances Perkins did support ER and helped establish one camp for women, Camp Tera. Progress was initially slow getting Camp Tera running as there were different requirements for joining for the women than for the CCC men. ER was instrumental in changing the requirements so that more women were admitted, raising the standards of the camps, and forcing the creation of new camps. It was not until after ER convened the White House Conference for Unemployed Women on April 30, 1934, that she began to see her idea for a nationwide jobless women's camp achieved. Although much smaller in size than the CCC men's camps, by 1936 ninety residential camps served 5,000 women yearly. In all, 8,500 women benefitted from working at a residential camp in a program that ER was instrumental in creating. Cook, Blanche Wiesen. Eleanor Roosevelt: Volume Two, 1933-1938. New York: Viking Press, 1999, 88-91. Kennedy, David. Freedom From Fear: The American People in Depression and War, 1929-1945. New York: Oxford University Press, 1999, 144.